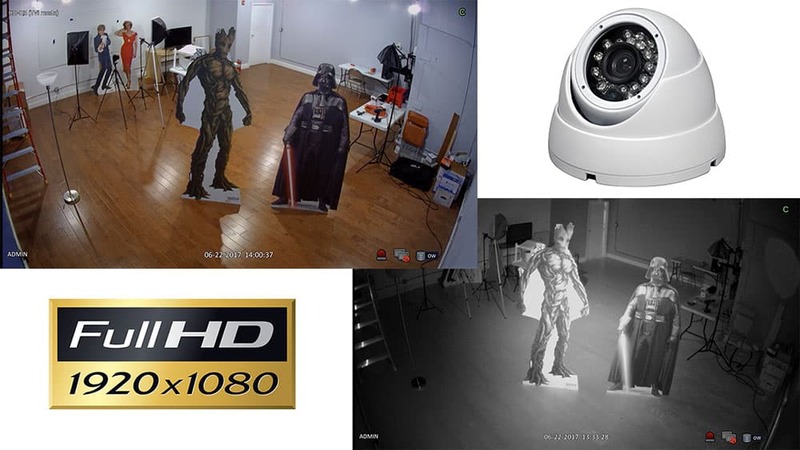 The HD-D180 is a 180 degree dome security camera with 1080p / 2 megapixel resolution. The HD-D180 also has built-in infrared night vision. There is also a bullet style version of this 180 camera available here. These ultra wide angle security cameras are best sellers at CCTV Camera Pros. The PTZ-HD-10 is a 1080p HD pan tilt zoom camera that supports PTZ controls over coax cable. There is no need to run an addition RS-485 cable for the PTZ communication. The HD-Q3 in an 1080p HD dome security camera that can be used indoors or outdoors. This cameras ball / gimbal type of mount allows it to easily be pointed in any direction. The HD-BL8 is an indoor outdoor bullet style camera. The HD-Q7 is a bullet style camera with built-in infrared night vision. This camera is weatherproof. All of the above camera demos were performed by connecting each camera to an iDVR-PRO surveillance DVR. iDVR-PRO has outstanding remote viewing apps for iPhone and Android so that owners can watch their security cameras remotely over the Internet. Watch this video to see the live remote view from the iDVR-PRO app for Android. Remote playback of video recorded to on the DVR’s hard drive is also demonstrated. Watch this video to see the live remote view from the iDVR-PRO app for iPhone. Remote playback of video recorded to on the DVR’s hard drive is also supported by the iPhone app.